Are There Only Two Steps To Being A Great Leader? If I asked you to picture a good leader, who would you think of? An old boss, a church pastor, a captain of one of your teams. Or maybe you think of a celebrity leader. Like Patton or maybe a President. To tell you the truth, I don’t think of much when someone tells me a person is a great leader. Why? Because I’ve never had direct experience with the leader they are pointing out. I always think “that’s nice” and then I watch them to see if they prove it. Prove to me you are a great leader. That you have what it takes to lead me. I was thinking about this the other day while I was contemplating on my own ability to be a better leader. The more I thought about it, the more I realized it’s just two steps. 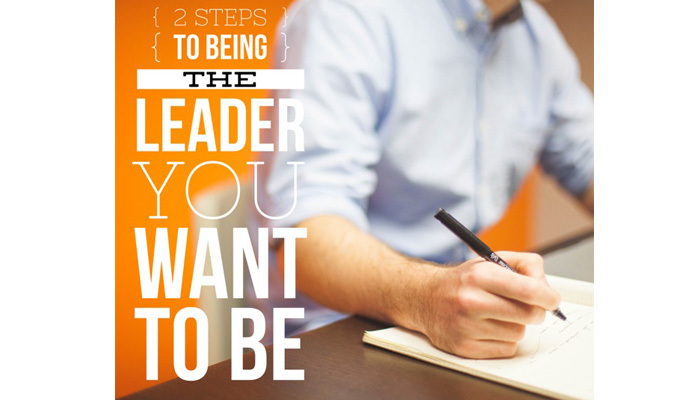 Two steps are all you need to be a great leader. Step 1 – Define what leadership means to you. Now you may have all sorts of different characteristics that define leadership. You have your list, I have mine. When you Google leadership qualities, there are going to be lots of articles and books on the subject. Here is the top ten traits – here are the top 25 qualities. Everyone’s got an opinion. And so do you. So why not define leadership your way. I’m sure the leadership qualities you believe in aren’t far from mine. So write them down. This is what I put down and in the order I liked. Inspiration with Confidence – How hard is it to inspire? Damn hard. So when someone inspires me, I go all out for them. Tie that with confidence (true confidence in that they know what they are doing) and you’ve got a leader to be reckoned with. Decisive while Accountable – To me, a good leader knows he or she is there to make the tough decisions. Committee meeting after collaboration meeting after email thread with a wish-washy decision drives me crazy. Make the decision and let’s run. But once the decision has been made, leadership is held accountable. Why is it so unforgivable for leaders to make mistakes? Because they rarely take the hit. If they take the hit, then I have more respect for them. Blame others and I’ll shake my head and walk away vowing never to follow you again. reativity without focus is chaos – which leads to changes in plans, careers, and organizations. Not for me. Optimism in the face of Commitment – A good leader doesn’t have to be an eternal optimist spewing rainbows and unicorns when actually the sh!t’s hitting the fan. Leadership means you can rally people and get them to dig in and fight through it which leads straight to commitment. If the leader is in the trenches with me and still has his or her head up – I’m right by their side. Honesty with a Sense of Humor – Leaders are honest about everything. They might not be able to tell you everything but they aren’t going to lie about it to cover it up. Combine that with a good sense of humor (and humor is sometimes the easiest way to get the truth across) and you got somebody I will listen to. Not just take orders from. Awareness that leads to Intuition – This is a tough one for leaders because sometimes they are far removed from the day to day. But that’s their fault and they need to be more aware of what’s going on with the company, the people and the situation. This awareness will help so much when it comes to intuition – when you are hyper aware, your gut will let you know whether or not you are making a good decision. Without the awareness, you might as well flip a coin. You probably have more or maybe you’ll cut some of these out and that’s fine. I’m not here to say you have to have these qualities to be a good leader. I just want them if you are going to be my leader. Pretty simple, huh? You listed out what you wanted and now you can become a great leader – just follow what you want others to see in you. How do you know if you have these qualities? You can always ask someone you trust but I would bet hands down you are smart enough to know if you’ve got these characteristics. That internal voice that judges your current leaders about their skill set – just turn it on yourself and see what it says. If it says you need to work on something, then listen. You can only get better and be the leader you’ve always wanted to follow. What are your favorite leadership qualities?